Natalya Gogina is the artist who painted this beautiful Fedoskino box. Natalya was born in 1956 in the town of Yekaterinburg. Now she resides in the town of Zelenograd, Moscow Region. In 1976 she finished the Fedoskino Art School. At present she works at the Fedoskino factory of miniature art, at the Zhostovo factory of miniature painting and teaches at the Fedoskino Art School. 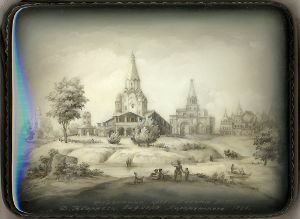 The box shows how the Kolomenskoe Village situated not far from the center of Moscow looked like in 1795. The scene is painted in grey tones of oils in the realistic style. Silver scan patterns wrap around the edges of the lid. The box is constructed from paper-mache. Black lacquer is used to paint the exterior of the box while red lacquer completes the interior of the work. The box has a hinge from the top of the scene, and rests on a flat bottom. Signed with the artist's name, Fedoskino, the year of 2007 and the title (“The Village of Kvarnegi. The View of the Kolomenskoe Village”).